Something i needed to share. ...and that's why space will be amazing. Damn... imagine that in the future. Epic. lol we'll have cured aging waaaaaaay before we get to the point. Unless you want to grow old and decrepit for whatever reason. lol we'll have cured aging waaaaaaay before we get to the point. Not necessarily. There's already a company offering lunar orbits by 2015. I'm guessing by the time someone of my stature will be able to realistically afford something like this, a woman of this age would be my granddaughter/great-granddaughter. Okay, even if 2015 weren't almost unrealistically optimistic, the picture depicts something that's like 50 years in the future. 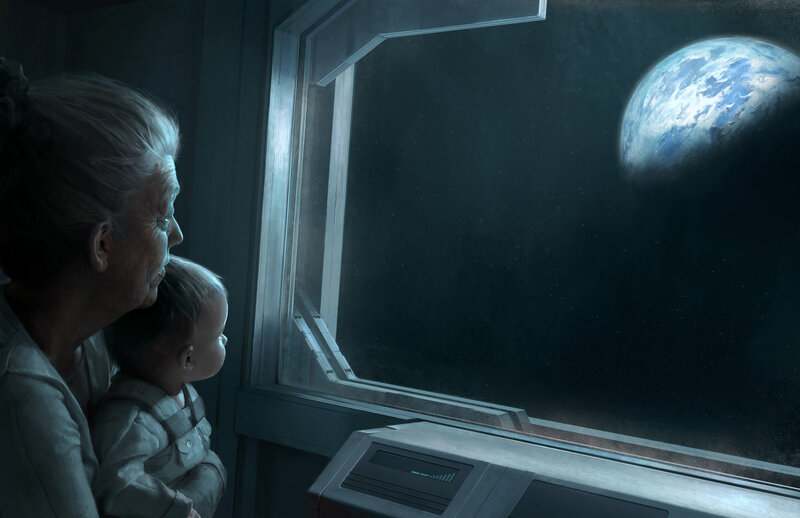 When space travel is so affordable that a g-ma and her granddaughter can fly in a capsule (and look at that capsule - we're not even close to that kind of technology) we'll have reached longevity escape velocity by at least a decade before then. even if we do have commercial lunar orbits by 2015 it will cost a boat load... and i highly doubt it will be possible for babies and the elderly by 2015 most likely there will be limits like you have to pass a health test before they expose your body to everything involved from g forces to radiation and everything in between. This is definetly the far future when aging has at least been halted. and getting into space isn't hard on the body at all. I think the picture is being a bit over-analyzed... As far as when this will be possible, if it does look like that, then yes, we'll probably have cured aging by then. I think it's just a good representation of what attracts people to space. My two cents. Well there's no doubt that many people alive today will have a chance to go into space, in perhaps 50 years from now because of cost. But having reached longevity escape velocity for people alive today is just a fantasy. Longevity escape velocity will be reached some time in the 22nd century. And that photo depicts artificial gravity, which IS in the far future. Based on increasing life expectancies, that woman would look to be about 120 in 2060. Well there's no doubt that many people alive today will have a chance to go into space, in perhaps 50 years from now because of cost. 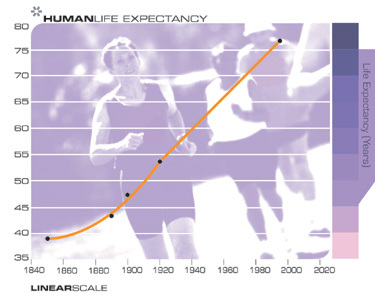 But having reached longevity escape velocity for people alive today is just a fantasy. Longevity escape velocity will be reached some time in the 22nd century. And that photo depicts artificial gravity, which IS in the far future. Well you're quite the pessimist, despite all the evidence pointing toward mid-21st century at most. We will have space colonies with population of 1,000,000+ by 2075. Okay, well I don't know about that lol that's kind of hard to predict and there's a lot of hurdles that really don't think will be overcome by that time. Well if we get there by 2050, which is what a lot of people are saying, it might be possible to obtain that achievement. But there's no evidence supporting this. At least there's evidence supporting the fact that space travel is getting cheaper, especially with the private sector in on the ordeal. But for longevity? I just don't see any evidence to portray any particular trend that might indicate longevity escape velocity would be reached any time during this century, much less 2050. If you're going to convince me, show me data. Well the two videos on the front page of this very site are a good start lol. Google "the genomic revolution" while you're at it too. "In the eighteenth century, we added a few days every year to human longevity; during the nineteenth century we added a couple of weeks each year; and now we’re adding almost a half a year every year. With the revolutions in genomics, proteomics, rational drug design, therapeutic cloning of our own organs and tissues, and related developments in bio-information sciences, we will be adding more than a year every year within ten years." Within ten years, genomes can be sequenced for less than $1. Combine that with the other radical improvements in biotechnology like drug design and gene therapy. Given how fast our technology is shrinking, we will have nanomachines by the 2030's (I can show the exact calculations for this if you wish). Medicine has just recently become an information technology, meaning it's not going to improve as fast at an exponential rate. Look at biotechnology and nanotechnology 40 years ago. Neither didn't even exist. Leroy Hood, one of the pioneers of the Human Genome Project, said in 2010: "Medicine is going to become an information science. The whole health-care system requires a level of IT that goes beyond mere digitization of medical records, which is what most people are talking about now ―In ten years or so, we may have billions of data points on each individual, and the real challenge will be to develop information technology that can reduce that to real hypotheses about that individual. I also think it will lead to digitization of medicine, the ability to get relevant data on a patient from a single molecule, a single cell. I think this digitization in the long run will have exactly the same consequences as it has had for the digitization of information technology. In time, the costs of health care will drop to the point where we can export it to the developing world. That concept, which was utterly inconceivable a few years ago, is an exciting one." I can also show tons of claims from top biomedical engineers and mathematical biologists about how viable it will be in 40 years to achieve longevity escape velocity. It's a matter of curing diseases and combating senescence. We will have a much greater understanding of biology and the technology necessary to combat it in 20 years. I give the date 2050 as a very conservative estimate. I would like to see more. And I thought longevity escape velocity was only good for people up to the age of 60 yrs old or so. Anything after that, people are too old. In 40 years from now, I'll be 70. Well, that certainly looks great for a young lad such as myself wanting to live until I don't want to live no more. OT: While a cute picture, I must agree that by the time the picture can become reality, grandma will look quite a bit younger. That, or grandma is great*10 grandma. But what should it be about?